Agricast has this month launched its new range of Tungsten Carbide parts. 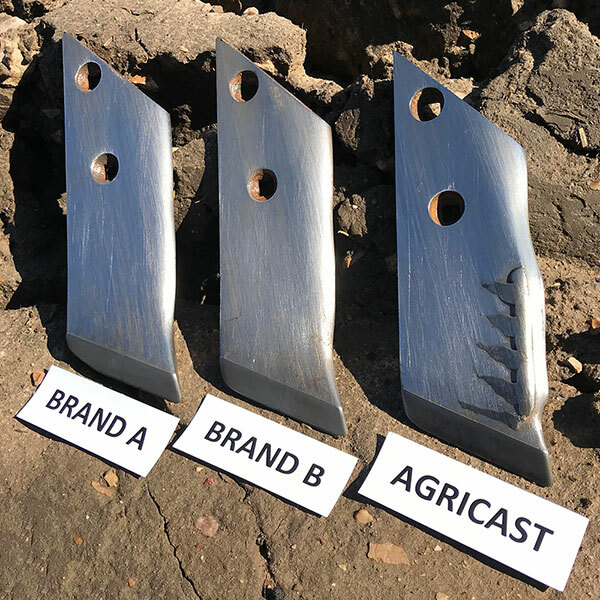 Designed to replace old wearing steel parts, the new range comprises plough points, cultivation points and weld on tiles in many different shapes and sizes. The Tungsten Carbide tipped parts, which are made to strict quality standards in the European Union, will last between four and ten times longer than their steel counterparts. At launch, Agricast’s range of Tungsten Carbide parts are available for Gregoire Besson, Dowdeswell, Kuhn, Kverneland, Lemken, Ransomes and Rabe ploughs and Horsch, Kockerling, Simba / Great Plains and Vaderstad, cultivators. The direct replacement OEM parts are complemented by a wide range of weld on Tungsten Carbide tiles, edge strips and points. As well as excellent quality, competitive pricing and quick delivery, Agricast’s Tungsten Carbide parts also offer agronomical benefits. As the new range will maintain their sharp cutting edges for far longer than steel parts, the risk of smearing and soil compression, which affects water and air movement, is reduced. Based on the family’s Lincolnshire farm, Agricast is the UK’s leading Cambridge roll ring specialist and also supplies a wide range of press rings, disc blades and subsoiler wear parts. Agricast also offers bespoke alterations and fabrication services. For more information or to place an order call 01673 857 619. Specialists in Heavy Cultivation Parts. Sign up to our newsletter and stay up to date with our latest releases and promotions!